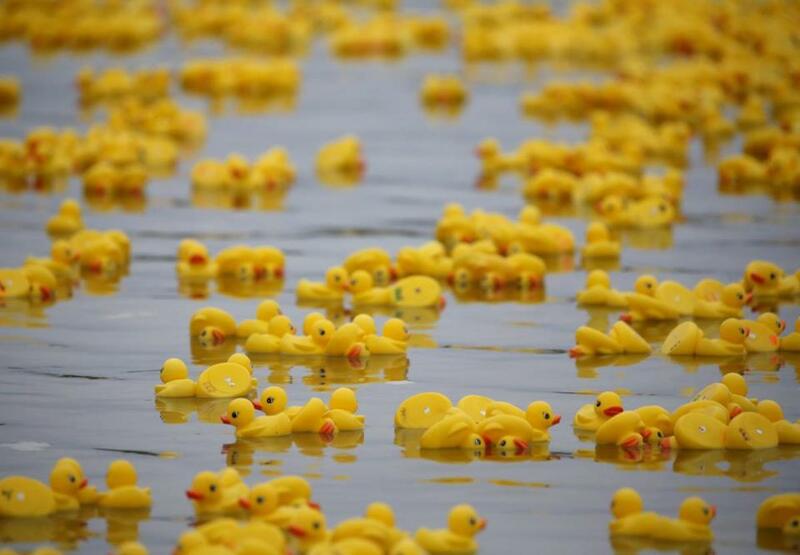 A new ad uses rubber ducks to represent trash flowing through the water supply. The Massachusetts Department of Environmental Protection announced a new awareness campaign Friday that aims to tackle the state’s fastest-growing type of water pollution: stormwater runoff. The campaign, “Think Blue Massachusetts,” will help 260 communities in the state meet new federal stormwater requirements that urges cities and towns to implement stormwater pollution prevention efforts like public education and outreach to targeted audiences, the MassDEP said in a statement. The campaign launch was announced at Joseph H. Gibbons Elementary School in Stoughton during an event Friday where fifth-graders revealed a rain garden they helped build that collects water during a storm and naturally filters out contaminants as the water seeps into the ground, the statement said. The school’s principal, Lynne Jardin, said in the statement that the rain garden provides “a real-world model of an infiltration system,” serving as an outdoor classroom for students and for those who attended the event. “An added bonus to our community is that students are now expressing interest in becoming engineers to help solve world problems,” Jardin said. Stormwater runoff includes all contaminants, like fertilizers, trash, oils, pet waste, and gasoline, that travel with rain or melting snow along roadways and parking lots, eventually making their way into rivers, lakes, ponds, and oceans. MassDEP said the newly enforced permit, called the Municipal Separate Storm Sewer System, will reduce the amount of stormwater runoff entering bodies of water. Ultimately, Think Blue Massachusetts will generate enough awareness among businesses and residents of the effects of this type of pollution that they will be encouraged to do their part to reduce it, MassDEP said. A website provides customizable flyers and posters for community events, as well as a webinar for local officials on how to document the use of the material in their annual reporting requirements, MassDEP said. The campaign was developed by the Statewide Stormwater Coalition with a grant from MassDEP.